I’m sure it hasn’t slipped your notice that the nights are drawing in faster now and the weather is on the turn – sure fire signs that winter is approaching. For many people this means putting on the heating and wrapping up warm, but should the same provisions be made for our horses? Here we discuss the benefits of turning out a horse for winter and offer some useful tips and advice. Let’s not forget that horses haven’t always been domesticated. Inherently wild, they lived outside come rain or shine and were no worse of for it, whether on the foothills of mountains or the desert plains. In fact, it was the outdoors existence that many believe transformed the horse into the hardy animal we have today. During winter, as long as there is natural shelter to be had, most horses will be happier outside than in. A tree will suffice, so long as its canopy can keep off the worst of the weather. The exact opposite is probably true for summer when horses fall prey to flies and enjoy the refuge of their stables. 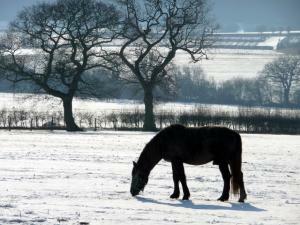 So, with winter rearing its frosty head, what’s the plan for your horse? Are you going to turn it out to pasture or keep it stabled and sheltered from the elements? There are undoubtedly pros and cons for both options and most of us will already have our established winter routines. For some, winter stabling works wonders, allowing the pasture to replenish for summer and ensuring the horse is kept warm, dry and protected from seasonal illness. For others, winter stabling will welcome a host of problems resulting from boredom, excess energy and lack of grazing. Not all horses respond well to confinement and will weave, crib bite, bolt feed, wood chew and kick the walls of the stall out of frustration. Stabled horses also need a dedicated slot for daily exercise, as 24/7 stabling is detrimental to happiness and health. Daily turnout, if only for an hour or so, will get your horse's circulation going and provide an outlet for its pent up energy. If you don't get chance to exercise your horse, be sure to adjust its daily food ration. Fibre is very important for stabled horses if you are to avoid colic, so having haylage available round the clock is essential. Respiratory problems can easily be triggered by dust and damp so ensure the stable is well ventilated, regularly mucked out and that forage is soaked for 20-30 minutes before being offered. Interactive treat toys will help stimulate the senses and alleviate boredom during periods of confinement. If stabling your horse through winter works for you, stick with it. For some horses i.e. convalescing equines or pregnant mares, turning them out in extreme cold, even with a high quality rug, is far too hazardous. Horses that are underweight may also fare better being stabled through winter when the quality and quantity of grass declines and regular forage isn't guaranteed. On the flipside, if your horse is carrying a few extra pounds, turning it out might prove an effective solution for weight management, not to mention your horse will be better insulated. Other times, a horse is simply used to being stabled over winter and adapts well to a change of environment. However, if you want to uphold your horse's routine and turn it out as much as possible through winter, hopefully the following bullet points will reinforce the most basic care measures. - Before turning your horse out, have a good look at its teeth. Foraging for food becomes a lot harder in winter with mud and snow on the ground, so horses must be able to successfully extract whatever small shoots and grasses they can find, and chew them properly. Older horses are much more likely to encounter dental problems, so keep this in mind. It is also advised that you check the integrity of your horse's skin and coat before you turn it out, as, effectively, this is what will keep it warm during the cold winter months. Achieving a conditioned coat ahead of winter is probabaly advisable - to view VioVet's complete range of equine skin and coat supplements, click here. Being conscious of your horse's weight is also very important if you are to monitor how it is coping with the winter turnout. Any weight loss should immediately be evaluated by your vet. - Always assess the pasture before putting your horse to graze on it. Consider the fencing and terrain and check for any potential hazards. Even if you know the field well, don't neglect to check the fencing in case recent bad weather has uprooted or destroyed it. This is particularly important if you regularly rotate fields to let pastures replenish. When the weather is particularly bleak and the grazing is sparse, place haynets around the field for your horses to forage on. Roughage is needed to prevent gastric ulcers, by absorbing the stomach acid your horse is continually producing. - Look for appropriate shelter before turning your horse out. Appropriate shelter doesn't have to be anything more than a small collection of trees, so long as they hold off the worst of the weather. Most trees are fairly naked come winter and provide very little shelter at all, especially to a large group of horses as opposed to just the one. In this case, it might be worth constructing a sturdy shed or lean-to with a roof and three walls. You'll probably find that your horse still favours standing outside but at least you can rest easy that, should a blizzard come your way, your horse will have somewhere to go. - Keep your horses warm - but not too warm! It can be very tempting to over-rug a horse, especially when we are really feeling the cold ourselves. In actual fact, horses are far more equipped to survive winter than we give them credit for. Most horses, unless they are underweight, ill or fully clipped, will manage perfectly fine in a medium weight turnout rug. If the inclement weather doesn't produce frost or snow, your horse's skin and coat should be all the insulation it needs. Some people like to blanket horses that are turned out, although there is much dispute about whether this is safe or not. Poorly fitting blankets can cause chafing and discomfort. They can also shift, causing your horse to become tangled. If a blanket is not removed as soon as the weather turns mild again, or, if the blanket isn't made of breathable materials, your horse can sweat excessively, quickly becoming uncomfortably damp. However, at some point or another during the British winter, your horse is going to require a turnout rug. These are designed for outdoor use and come in a range of shapes and weights, depending on the horse in question. A good turnout rug will prevent your horse from getting overly muddy or weather-worn, will be breathable, lightweight, and will comprise secure buckles and fittings. - Lastly, remember to check on your horse regularly. This doesn't mean glancing out of your window every now and then and making sure your horse is still there. Along with feeding your equine, remove it from the field to check its hooves, coat and rug, adjusting it if necessary. If you do this daily, you will notice problems and changes early on. Even if your horse appears to be thriving, don't leave anything to chance. If necessary, supplement forage with high quality hay and ensure you offer a balanced feed mix. Keep an eye on water buckets and troughs in particularly cold weather as you don't want these freezing over. It might be worth putting a ball into the bucket to stop this happening. Sound advice, makes me feel lucky that I have four miniature shetlands who ignore their shelter in winter, but enjoy relief from the sun in summer. Fly paper is excellent for hanging in a shelter during summer. Sensible article. I keep 3 PBA's who very much prefer to be out in the open. From my experience, the only thing that causes distress, is a combination of wind and driving rain and in such conditions, it's necessary to provide stabling or field shelters. I think why so many people stable their horses during winter is that they don't like to see them so unkempt, the natural consequence of an outdoor life.